Sometimes you come across an artist by chance. 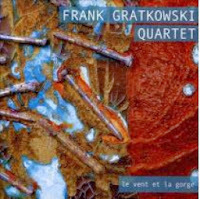 Although I (Martin) heard about Frank Gratkowski before, I haven't seen him live or bought one of his albums. But since I go to all of the concerts Peter Ernst organizes in his seminal Nigglmühle (a spectacular location in Bernbeuren, a small village in the Alpine Upland, which presents only two concerts a year) I got the chance to see Gratkowski's quartet. To cut a long story short: It was simply marvelous! Gratkowski is a musician with a lot of different talents. 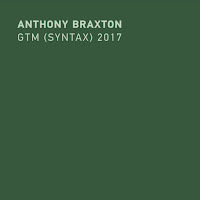 As a composer who tries to explore and expand the sound possibilities of his instruments he combines written elements with collective improvisation and as a reedist who is obviously influenced by Steve Lacy and Evan Parker he uses multiphonic and microtonal techniques. On top of his excellent musicianship there is also a very immaculate clarity and purity of his tone. Gratkowski is a prolific musician who produces several albums each year, we have selected three that have been released recently. 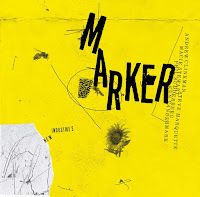 Gratkowski's most interesting project might be his quartet with Wolter Wierbos on trombone, Dieter Manderscheid on bass and Gerry Hemingway on drums. At the center of their latest album "Le Vent et le Gorge" (The wind and the Canyon) there is the 8-piece-suite "Harm-Oh-Nie" (a pun referring to "harmony" and "nie" - the German word for "never") which discusses the possibility of harmony and organized chaos. The first part is pure harmonious unison playing, as if real harmony seems to be possible - but obviously the composition sets us on the wrong track because there is an abrupt change of atmosphere and structure in part 2, a dissonant composition which reminds of a vivid, heated discussion with all four musicians involved. This is almost classical free jazz at its best. After a weird meditative interlude with the saxophone in front of warped loops, the band throws in three short pieces based on jazz/funk staccato riffs. Sometimes they are open for chamber music intersperses (part 4), and then the riffs are so harsh that they remind of heavy metal breaks (part 5) or they serve as a tight background for a wild sax solo which is almost going berserk (part 7). These pieces are only interrupted by a large, concentrated sound exploration (part 6) before a very short solo by Manderscheid - like an aftermath - finishes the suite. The other central composition is the title track, "Le Vent et le Gorge", actually program music imitating wind in a canyon. First the music seems to describe craggy mountains, wild, untouched nature, and then the wind soughs through (especially Wierbos and Gratkowski seem to exhale breath into mouthpieces and other parts of their instruments). Live it was particularly interesting to watch the band play this track, they were focused on the compositional parts just to get lost sooner or later as if the wind came in through an open window blowing away the sheet music so that they were thrown back on collective improvisation. As an introduction to Gratkowski's work this is a great start. You can buy the CD from the label. Gratkowski's work on 'All At Once', as the title would imply, is hard to single out. With three saxes blowing, all at once, it's hard to pinpoint an individual voice. 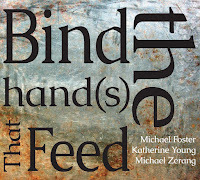 Gratkowski, along with Phillip Greenlief, and ROVA's Jon Raskin push, pull, poke and prod each other - with tracks starting out slowly and evolving organically, growing, twisting, and becoming songs drawn from thin air. It may be that there is a seed of an idea that the three agree upon, but like a conversation, each one takes on its own tone, twists and turns. The trio call, respond, laugh, argue and agree without missing a beat - or perhaps entirely without a beat. Rather, they follow a pulse as they lead the listener on a journey through sound and emotion, in all of its intertwining complexity and beauty. Gratkowski and his partners deliver a fascinating recording, and even when the listening gets tough and extended technique takes the helm, the interactions and textures that they create something far beyond each individual voice. 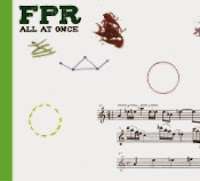 Like Relative Pitch's other albums in its growing discography, it's a challenging combination that grows stronger and stronger on each listen. 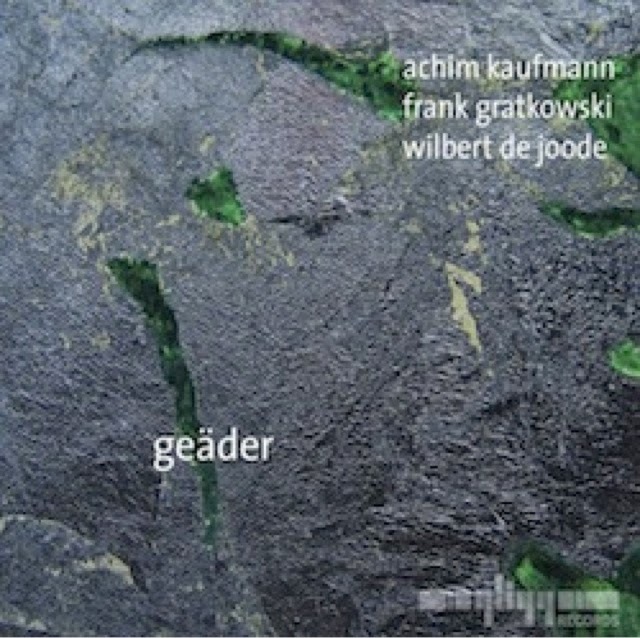 On this album Gratkowski (clarinets, alto sax) is joined by the German pianist Achim Kaufmann and Dutch bassist Wilbert De Joode, a group that has existed since 2002 and which has released three CDs - "Kwast" (Konnex), "Unearth" (Nuscope) and "Paläe" (Leo). The music of this trio has always been instant composing, there are no prearrangements or rehearsals, although some parts seem to be written out in detail. Albeit their instrumentation seems to refer to the legendary Jimmy Giuffre Trio their approach rather reminds of the Schlippenbach Trio (although that trio has Paul Lovens on drums instead of a bass player, of course). 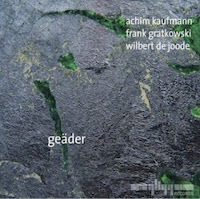 "Geäder" (which means "veins" in German) is very ramified indeed, yet it is also very transparent and energetic, spontaneous and unpredictable. Especially when Kaufmann plays the interior of the piano or when he throws in broken chords the pieces are very close to new classical music. Gratkowski, who is a perfect team player in this line-up, is able to display his complete spectrum of impressing techniques here. Like on the other two albums there is a lot of space for the music, timbral explorations mingle with fierce outbreaks, there is a collective, poetic unity. Discursive strategies are in the focus (as well as the quartet and FPR) and the communication and listening among the musicians are excellent. Favorites are the chamber-music-like "Involute" and the wild "Mettle" representing both ends of the musical spectrum of this splendid trio. So, if you have the chance to see Mr Gratkowski in any kind of collaboration live, don't hesitate. He is also a very funny musician, it might be possible to watch him integrate the putting-together of a clarinet in a composition or sometimes he throws in awkward dance acts. Above all, you can't go wrong with any of his albums. 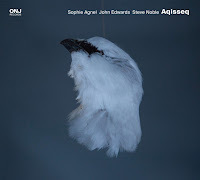 Further recommendations are all his albums with German pianist Georg Gräwe (especially "Quicksand" with Paul Lovens on drums), his album with Hamid Drake (Valid Records, 2010) or his alto quartet "Fo(u)r Alto" (Leo, 2012). 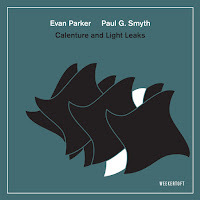 Hi Paul and Martin, excellent review and a great artist indeed. Other albums with Gratkowski reviewed on this blog are "Shift: Songs from Aipotu", "OirTrio - Kanata", "DuH - In Just", "Frank Gratkowski & Jacob Anderskov - Ardent Grass", "Carl Ludwig Hübsch - Primordial Soup", and his solo performance on "Arikulationen". The search engine is temporarily (I hope) out of order, but when it works again, you will the albums easily. Great musician indeed! This summer, Frank did a series of concerts in New York City. I was fortunate to be able to attend all of them: solos, duos, trio, quartets,etc. In other wides, a wide arrangements of settings, and a wide variety of musical partners. Two conclusions: his musicianship is superb, and he is among the most congenial of people in this line. Prompted by this review, I went hunting for FG albums. An excellent one I discovered is Mimetic Holds with Scott Looney, Damon Smith and Kjell Nordeson. So the lineup is similar to Nate Wooley's Howl and has a similar feel.